LAS VEGAS (Friday, January 29, 2016) – Handicapping contest veteran Dave Gutfreund – still known to many by his old nickname “The Maven” – leads the 17th Daily Racing Form/NTRA National Handicapping Championship Presented by Racetrack Television Network and Treasure Island Las Vegas with a $237 bankroll as the field was reduced to the top 10 percent – 63 entries – after Day 2 of the three-day tournament at Treasure Island. Ray Arsenault of Toronto, who led the NHC going into today’s final available race, held on for second with $236.40. A tightly bunched top 10 was rounded out by David Sullivan ($235), Charlie Davis ($232.60), the Day 1 leader Phil Bongiovanni ($224.40), Paul Matties ($223.90), Robert Engelhard ($219.70), Dan Camoro ($213.60), Joe Perry ($213) and Jeff Einardt ($211.40). The highest score on Day 2 went to John Downie, who posted $175.80 worth of winners Friday to earn a paid Breeders’ Cup Betting Challenge entry worth $10,000 and vault into 36th place overall ($185.40). 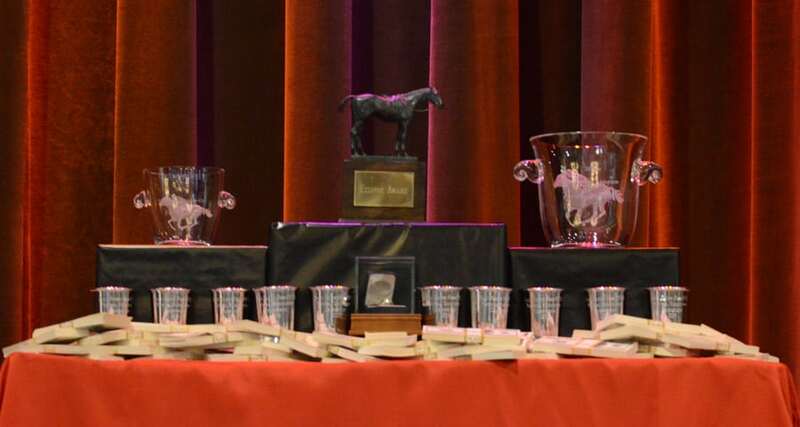 Those that made the cut with bankrolls at or above $170 will continue on to the Semifinal round Saturday and the subsequent top 10 will play at the “Final Table” to determine the final placings, including an $800,000 grand prize and Eclipse Award winner. Players left outside the final cut will play in a separate $50,000 Consolation Tournament on Saturday with reset mythical bankrolls. Gutfreund took the lead for the first time in Santa Anita’s eighth-race finale, with 8-1 shot Gathering Evidence. “I didn’t like the favorites and it was a Doug O’Neill first-starter that looked live,” he said. Other key plays for Gutfreund on the day included Jamie’s Dancer, the $27 winner of Gulfstream Park’s seventh; All Up in Lights, the $57.80 hero of Gulfstream’s ninth; and Creme Brulee, a $33.80 upset in Fair Grounds’ eighth. Gutfreund is a co-creator of the Derby Wars horse racing fantasy tournament website, and a regular contributor to Horse Racing Nation. This is his 12th NHC appearance. Full standings can be viewed online at NTRA.com, where the homepage features a scrolling live leaderboard and sortable/searchable standings of the entire field. For Day 2 the 629 NHC entrants were again required to place 18 mythical $2 Win and Place wagers – eight on mandatory races that everyone played and 10 on any of about 45 other races from seven designated racetracks across the country. Among the Semifinals players is 2007 NHC winner Stanley Bavlish ($206, 15th), who is attempting to become the first two-time NHC champ. Just above the cutline in 63rd was Randy Bauer ($170, 63rd) who was diagnosed with colon cancer a little more than a year ago. The 2015 NHC Tour winner Jonathon Kinchen, who was eligible for a $2 million bonus if he could annex NHC 17, missed the cut with both of his entries. The NHC concludes Saturday. Day 2 bankrolls will carry over to the Semifinals, which will consist of 10 optional plays from a menu of 29 races ending at about 12:30 p.m. PT. Bankrolls will also carry over to the Final Table, where the massive cash prizes from $800,000 for first down to $50,000 for 10th and the Eclipse Award for Horseplayer of the Year will be determined on seven mandatory races with estimated post times from 1:30-4 p.m. PT. The Semifinals menu of eligible tracks and race numbers (listed in order of first post time) are: Gulfstream 1-7, Aqueduct 1-7, Tampa Bay 1-7, Oaklawn 1-3, Fair Grounds 1-3 and Santa Anita 1-2. The Final Table races (with estimated PT post time) are: Gulfstream 10 (1:35 p.m.), Fair Grounds 6 (1:54 p.m.); Oaklawn 7 (2:09 p.m.), Gulfstream 12 (2:35 p.m.), Santa Anita 7 (3 p.m.), Santa Anita 8 (3:30 p.m.) and Santa Anita 9 (4 p.m.).